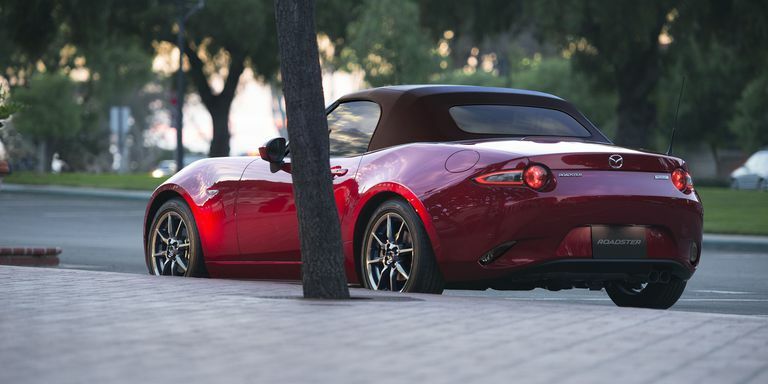 In March, we discovered a document filed with NHTSA that showed the 2019 MX-5 would have 181 horsepower. We speculated on the changes that would be necessary for the 26 horsepower increase at the time and found a few more details in April through a leaked document from Mazda Canada. Now that the updated MX-5 is launching in Japan, we have some confirmation on our earlier findings along with more technical details on how the boost in power is accomplished. Journalists from Car Watch had a chance to test the updated car last week and shared details of all the changes that are forthcoming for refreshed car. They break down the points of improvement into four categories that cover the engine, colors, safety, and steering. The vehicle tested is a Japanese market car so there might be slight differences in things like exterior and interior options from what we’ll see here, but it is almost a sure bet that the engine and other performance changes will carry over to what we’ll see later this year. The updates in the pistons allow for the increase of air and fuel to be safely combusted as the new design is optimized to prevent knock while maximizing thermal efficiency and minimizing emissions. The combusted mixture exits the engine through a new larger exhaust valve and a new exhaust manifold with larger runners. All of this newfound power is transferred to the transmission through a new low-inertia dual mass flywheel which is intended to absorb noise and vibrations so that they don’t transfer to the cabin. The performance changes are rounded out with a new muffler which has been updated to reduce high frequency noise and work better with the increased redline. Hashimoto Yohei of Car Watch states the changes in the exhaust are apparent as soon as the car is started describes the pull to 7500 RPM as exhilarating. He also states that the new redline allows the car to be wound out a bit more. That prevents upshifts that would have been required in the past and the Miata gets up to speed more quickly. The rest of the changes involve some new interior and exterior colors (as well as the absence of the ugly LED running lights) along with the addition of safety equipment which expands features like Smart City Brake Support to the roadster. The last category which they cover is a telescoping steering wheel, a first for any Miata. This will surely be an exciting development for those of us that are on the taller side. The author states that he was able to comfortably slide down further in the seat since the wheel can telescope in by 30 millimeters now.